In-house: there is probably no word more disputed in the watch industry today. Of course some brands stretch the concept in an attempt to join the elite circle of manufactures, a “club” that twenty years ago hardly anyone knew existed. Depending on who you ask, the definition of in-house varies as much as the people themselves, but in the wider context of manufacturing it is pretty simple to define. In-house manufacturing refers to the creation of some or all of the components of a company’s product, in said company’s facilities, and under its direct control. Basically, a brand may be said to engage in in-house manufacturing if it physically creates a significant percentage of its product itself as opposed to outsourcing production. In watchmaking, like the rest of the industrial world, in-house is really about economics and advantage. There are many reasons to manufacture parts or products in house (cost, speed, control, specialty, rarity), just as there are many reasons to outsource the production (efficiency, cost, speed, investment, resource management), and clearly the reasons can overlap. Specialization creates experts that are extremely efficient at manufacturing a specific product, so the reality is that sometimes it is nearly pointless, and prohibitively expensive, to create everything in-house when others do it more cheaply and better than the brand could do in-house. Even with in-house manufacturing, there are degrees of how much is actually produced in-house. Of course, there is always the cachet of saying one makes everything oneself, but rarely is that ever the truth. Even if a brand can say it starts only with raw materials, the statement itself is a misnomer as the raw materials were mined, grown, processed, or collected and turned into raw stock before coming to the factory. And those processes relied on equipment manufactured by other companies. Basically, brands are always getting something from someone else to create a product, it just depends on where it has to look. The real skill for a company is deciding what makes the most sense based on its business and customer base. Small brands with tight budgets have to be especially adept at weighing decisions like these, as every decision directly impacts their bottom lines. 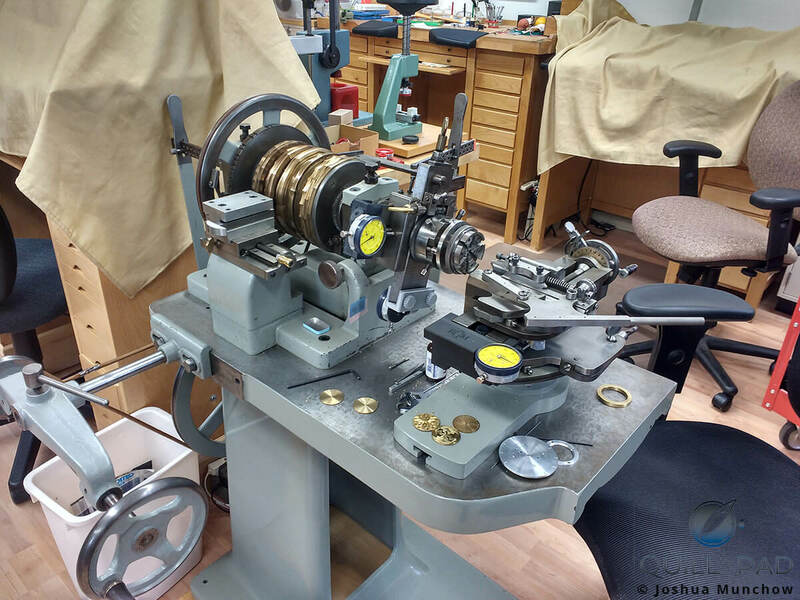 Recently, Elizabeth Doerr and I visited American watchmaker RGM Watch Company just outside of the United States’ traditional horological hotbed Lancaster, Pennsylvania and met with founder Roland G. Murphy (three guesses what RGM stands for). During the visit we saw firsthand how a small brand balances in-house manufacturing with local and internationally outsourced manufacturing to create top-notch products. RGM celebrates its twenty-fifth anniversary this year, and we saw how over the past 25 years RGM has evolved along with its manufacturing capabilities. Since the beginning, RGM has outsourced different components based on need and efficiency. Whether it was cases, movements, crystals, straps, dials, or crowns, at some point there was a source to obtain what was needed. But also since the beginning, RGM has created dials, movement components, and other required parts to manufacture its watches. Over the years, the brand has expanded its capabilities bit by bit, adding machinery, technology, and personnel in an effort to have greater control over production and to expand its design and engineering options. Each component in a watch represents a cost for manufacturing. When that component is outsourced, it is usually a fixed price per unit based on a quote. When a component is manufactured in-house, the cost is variable depending on the workload at any one time, current equipment capabilities, materials and tooling cost, and employee know-how. These are the same costs a supplier has, but the brand doesn’t pay for all of those as they change, only the quoted price. To manufacture something in-house for less, a company has to invest in better equipment and employee training, which will make parts easier or faster (or both) to make, reducing production costs. This has a caveat, however: some components require such specialized knowledge and equipment to produce (hairsprings, mainsprings, crystals, gaskets) that it isn’t cost effective unless the brand is particularly large and/or well-funded. This is the balancing act of manufacturing. RGM has been outstandingly efficient at choosing the right path at the right time. The brand has occupied a very cool old bank building in downtown Mount Joy since 2003. The space is fantastic, adding a definite locally infused aura to the watchmaking environment, but it does have limitations when it comes to manufacturing considerations. The main floor space greeting the visitor upon entry houses Murphy’s amazing collection of rose engines, a straight line engine, precision instrument lathe, jig borer, numerous watchmaker benches, and a design space with a 3D printer (used in the prototyping process and to make tool accessories and 3D-printed RGM loupes). But that is all the space available in the main area, meaning that any other manufacturing has to go elsewhere. This is where planning and intelligent space utilization come into play. In a large closet at the rear corner of the building, RGM has created a dedicated room where polishing, blasting, and cleaning of parts takes place. It isn’t a lot of space, but it adds a lot of functionality and keeps these activities separate from other clean areas, which can be a harder thing to accomplish than you might think. The bulk of component manufacturing takes place in the basement of the former bank, allowing RGM to perform a variety of processes in-house. There are two compact CNC mills producing plates, bridges, dial components, various movement components, and even buckles for straps, not to mention a large amount of in-house tooling to support the manufacturing process. Small lathes are set up for different tasks such as gear cutting and circular brushing as well as for general use. Stations equipped for striping, perlage, anglage, and polishing are arranged on a long bench to facilitate efficient finishing of components. In the room where the CNC mills are programmed there is an optical comparator and a digital vision inspection system for verification of part geometries. This is crucial when building movements as parts coming from a CNC mill are accurate, but hardly ever perfect, so inspection is needed to adjust cutting parameters to obtain parts within tolerances. This room also contains a small pad printing station, further increasing RGM’s in-house capabilities. The variety of machines allows a broad swath of manufacturing to take place, but the cleverly utilized space limits what can be done in-house. Like for many brands, springs, gaskets, crystals, and select components are easier to outsource from trusted suppliers. The cost of machinery to produce these items stands in no relation to the volume of RGM’s production. Coatings and enameling for dials are outsourced from Switzerland, the former even from Kari Voutilainen’s dial manufacturing factory, Comblémine. It goes without saying that straps are also sourced. RGM’s entry-level watch line, the 151, which starts at $2,950, is powered by Swiss ETA movements instead of the in-house calibers that Murphy began making in 2007. Production of the in-house calibers is limited by capacity and manpower, but since demand for the attractive entry-level watches stays strong, RGM still offers options with these reliable movements, which are adjusted and decorated by RGM’s Pennsylvania technicians. Cases are a somewhat big turning point for RGM, as they used to be sourced from Germany and Switzerland, but are now being made locally. The design is all RGM; the stainless steel used is sourced in the U.S.A.; and the individual case components are machined and wire-cut less than ten kilometers (six miles) away from RGM’s Mount Joy workshop. The brand’s own watchmakers and technicians do the final case finish, polish, and assembly. An exception is gold cases, which are still sourced from Switzerland. This means that for RGM, another point of production has switched stateside, which strengthens the brand’s “American Made” ideals. This also allows RGM to make cases based on Murphy’s own design and to his own specs, ensuring a level of quality control that is difficult when using international suppliers. The CNC mills and lathes required for machining larger components like cases are much larger (and more expensive) than those for smaller parts, which explains why RGM has not acquired these machines. The tight quarters of the former bank basically wouldn’t allow machines of that size to be installed without a major overhaul of the building; the floors couldn’t hold the weight (they have already been reinforced for the present machinery) so the machines would have to go in the basement. Getting something that size into the building’s basement would likely require digging out the side of the building and cutting through the foundation, a risky proposition for the small number of cases the brand needs. The best bet would be to find another location for the machines to make larger components. RGM is keeping an eye open for a possible future second space, one that can function as a larger scale machine shop; this is part of a calculated assessment of value versus risk. That really is what it all comes down to for any small business: value versus risk. Large companies with millions of dollars can afford to be risky in attempts to “set themselves apart” by becoming a full in-house manufacture. But for a majority of the rest, it is always a tightrope walk between the efficiency needed and the innovation wanted. The best can leverage their capabilities to increase capacity and minimize production costs. This is where RGM is positioned to take advantage of the talents of its employees and the capability of its machinery without any pretense or the need to be 100 percent in-house in every case. In Switzerland, there is a lot at stake to be Swiss Made and even more to being as completely in-house as possible (though in-house Swiss Made brands source the same components such as crystals, jewels, springs, and the like). RGM makes watches to Swiss standards, using its own production capabilities and, as need be, with the best components sourced from great suppliers in the United States and abroad. When the pressure to be completely in-house is removed, it is much easier to assess where investment makes the most sense. RGM’s evolution over its 25-year lifespan is evidence that the American brand understands where its value lies. Every company in the business of making a physical product constantly assesses these truths. In-house manufacturing can be ideal in a perfect world, but in the competitive and variable world of business, it is never that easy. Anyone working in manufacturing understands this and probably has no illusions about what should or should not be manufactured in-house for a mechanical watch. The focus really should be on quality and value since that is what consumers most desire when they buy goods. Even in the world of luxury watches, any description of a watch’s desirability will at least touch on its value relative to the competition. Most people don’t like to waste money, and especially for a brand that manufactures an expensive product. I think it’s time we as consumers shift the focus back to what actually makes a product great. Craftsmanship, precision, finish, and innovation are all great qualities that do not preclude outsourced components. Apple doesn’t actually make many of the components in its phones or watches and yet it is still adored as a computer engineering master. That is because Apple chooses the best of the best and integrates it into the things it makes, creating something bigger than the sum of its parts. Why should we expect or require anything more from a watch brand, especially one that doesn’t have even one-thousandth of the capital behind it? RGM makes exceptional watches, and the effort behind them is no less fantastic than any other brand regardless of location. The main difference is that RGM knows firmly who it is and what it wants to be. After our visit with Murphy and RGM Watch Company, I can attest that there is something special in Mount Joy, PA, making it a terrific case study for the validity of in-house versus outsourced manufacturing. I look forward to seeing products continue to come from this company for many years to come. For more information please visit rgmwatches.com. I can’t speak to their entire lineup when it comes to movements, but I know at least one is missing from the list above. The 300 Diver series, that I have in the blue version, utilizes the ETA 2892-A2. We also use a few other vintage movements from time to time. Thank you for the complete information, Roland! I will update that line! Great article! 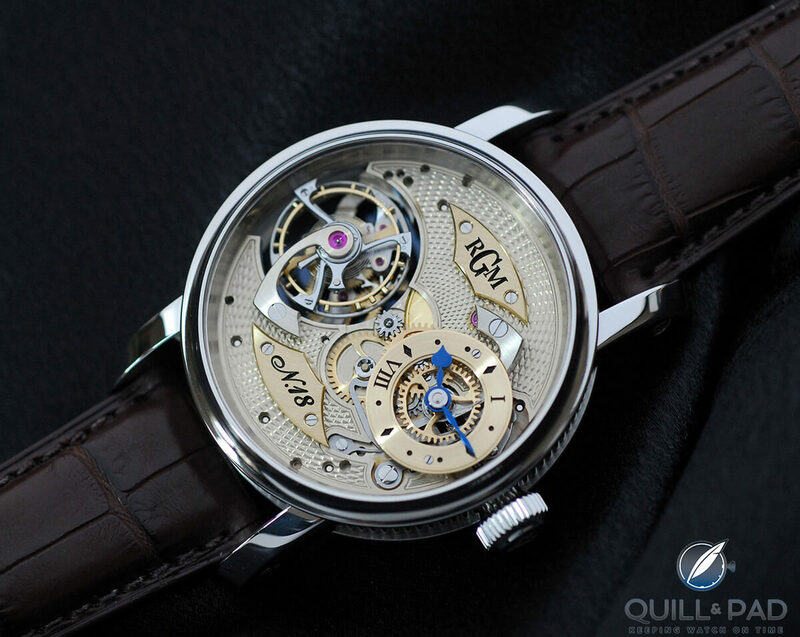 I have been a customer of RGM for a number of years now and have visited RGM on a number of occasions. I am always struck by how generous Roland is with his time and his enthusiasm for watches and watch-making. I will always be grateful for the time and care Roland and his team took to help design a Caliber 20 watch to honor my late father. I also own two Caliber 801s and the craftsmanship and quality of these watches are second to none. I am always excited to see what new watches they produce. That’s amazing information, John, thank you for sharing! Why don’t you post some pix here? Is that number of employees correct, 12? If so, the number of watches (and variations) that they do is nothing short of amazing! True story on both accounts!